Thanks to the Georgia Forestry Commission for leading the way estimating our losses. Because of so much ‘severe’ and ‘catastrophic’ damage, the numbers changed quite a bit. They ranged from 1/3 to 1 billion dollar loss for Georgia. We are below a billion for sure. Those numbers are already hard to comprehend. 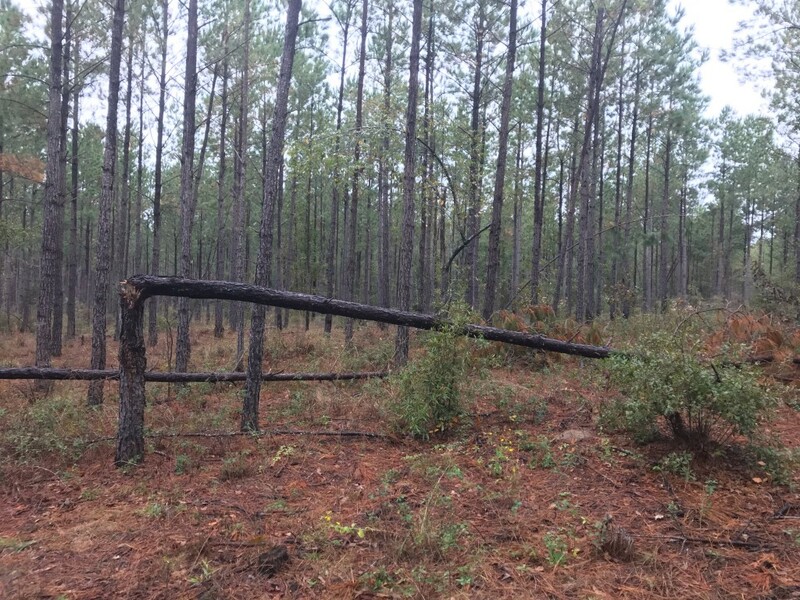 2.4 million acres of timber was damaged by Michael in Georgia. It was similar in Florida with about 3 million acres. In Georgia, 300,000 or 16% was classified as ‘catastrophic’ damage. 1.4 million acres or 61% is in ‘moderate’ damage. As of now, 37.68 million tons of timber are on the ground. The hardest part is salvaging this much. After Hurricane Hugo the goal was to salvage 25%; they only got 16%. In a 75 mile radius of Bainbridge, there is million more on the ground than mills take in annually. We actually have more mills in the 75 radius of Rochelle than they do in Bainbridge, about 44. In Wilcox County, most of the damage is on the west side of the county. It’s moderate damage at best. In the middle and east part of the county, you will see trees that broke off at a canker or weak spot and that is all. Moderate damage is 25% total, often enough trees to thin back to. With moderate damage, we only need to watch these stands for bark beetles at this time. It is best not salvage moderately damaged stands right away. The timber market was already flooded before the storm. So moderate damaged stands are in no rush to salvage. Also, with 34 degree temperature last night, a soon frost will slow bark beetles. Only in the severe and catastrophic do we need to salvage. When salvaging, pay more attention to what is still standing than what is on the ground. 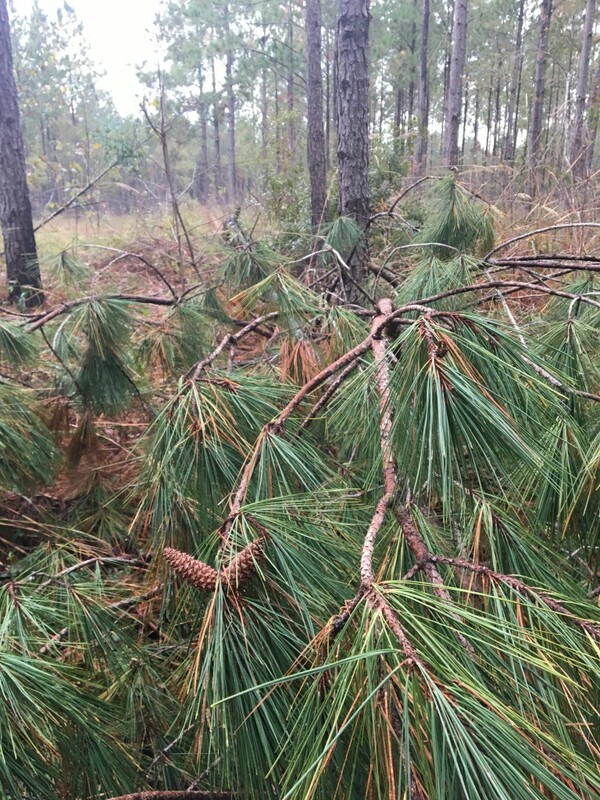 Uprooted, large pines tend to stay green until spring (March – April) of the following year. You have about a 5 – 6 month window for high value uprooted wood. Where tops break off of trees, we need at least 3 live branches for trees to live. The trees of course may grower slower than a full crown. There has been work done on <5ft to 40 foot tall trees. The smaller the tree, the more likely it straightens back up. Anything over 60 degree lean will most likely NOT straighten back up. For higher class of leaning trees, we need more data. 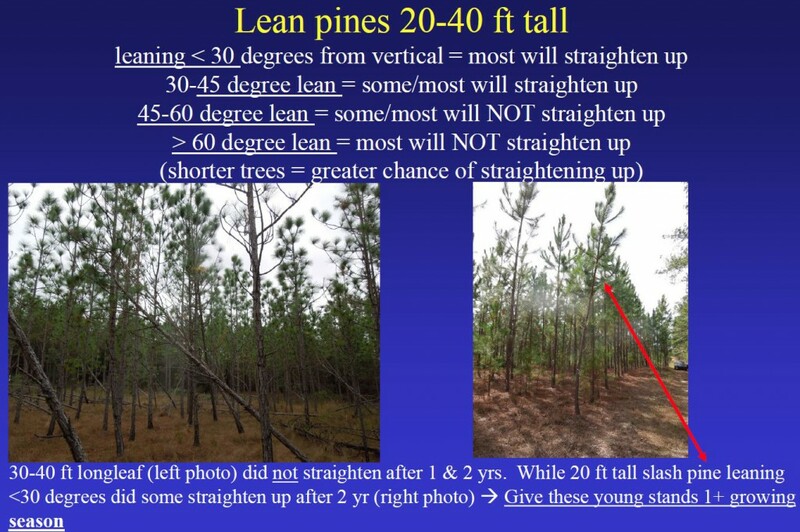 UGA Extension Forester Dr. David Dickens talked with me about measuring some leaning trees in Wilcox County. Thankfully, we didn’t have severe damage. But we had some stands with leaning trees, anywhere from 10 degrees to 90 degrees. 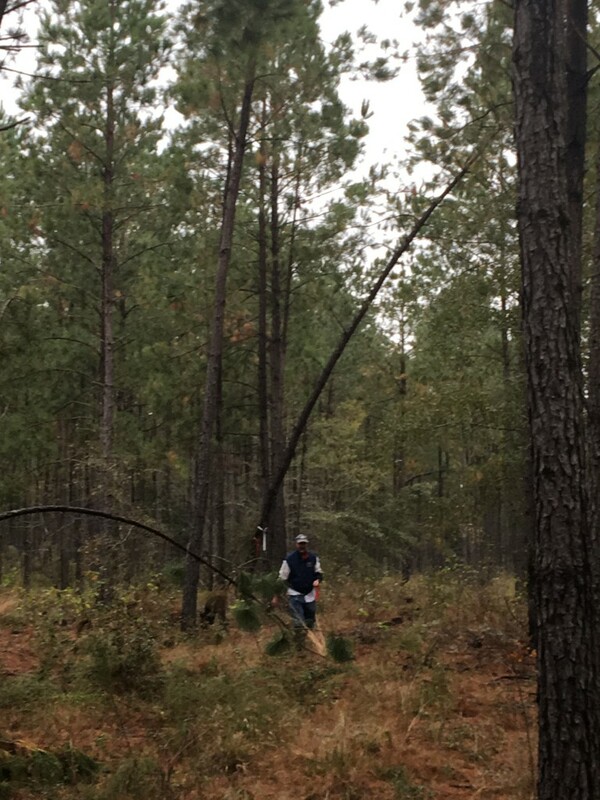 I found us 3 stands of three different height classes, and this Monday we measured 161 trees across three locations in Wilcox County. We looked at longleaf, slash and loblolly. We marked leaning trees according to degree lean and will check back in 6 months and 12 months to see how much they straighten. 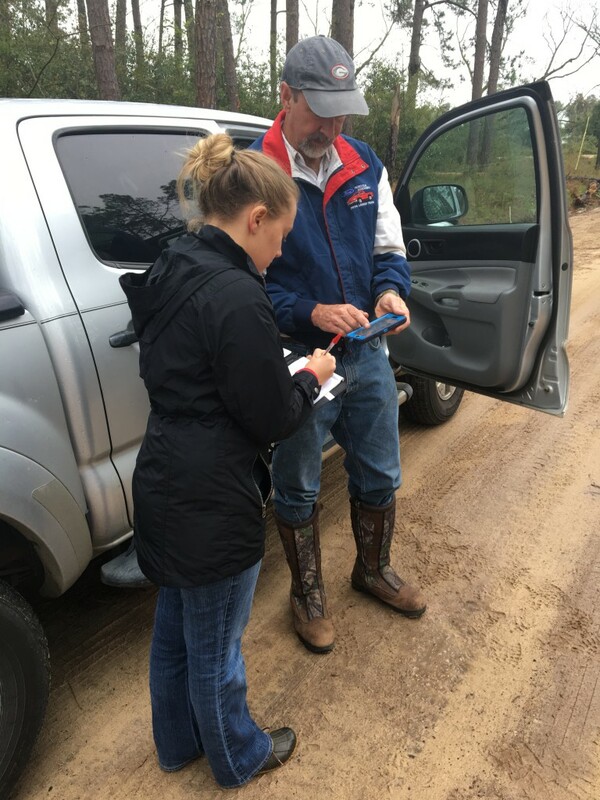 Warnell School of Forestry & Natural Resources Dr. David Dickens is back in Wilcox County measuring trees for lean and looking at damage from Hurricane MIchael. Very few trees broke and fell over. 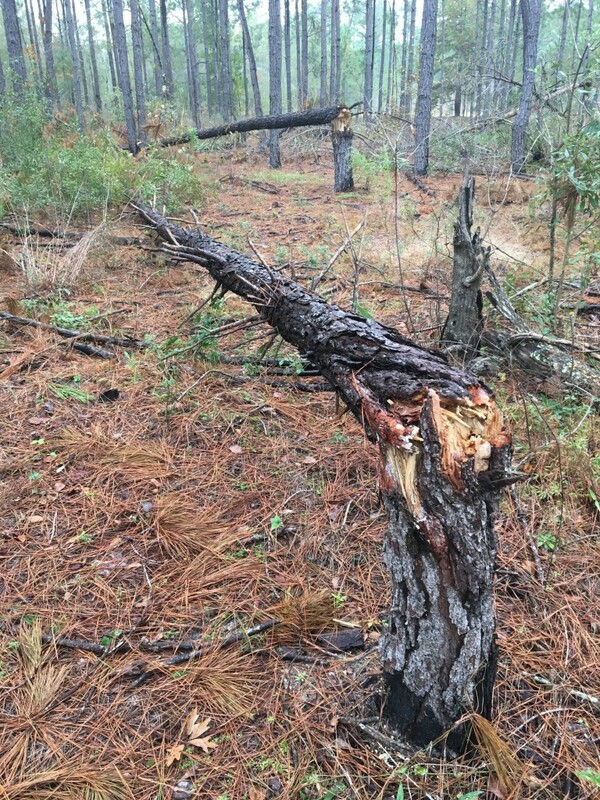 Most if not all fallen trees snapped at a canker or weak spot. Green tops from uprooted trees stay green until about 5 – 6 months. 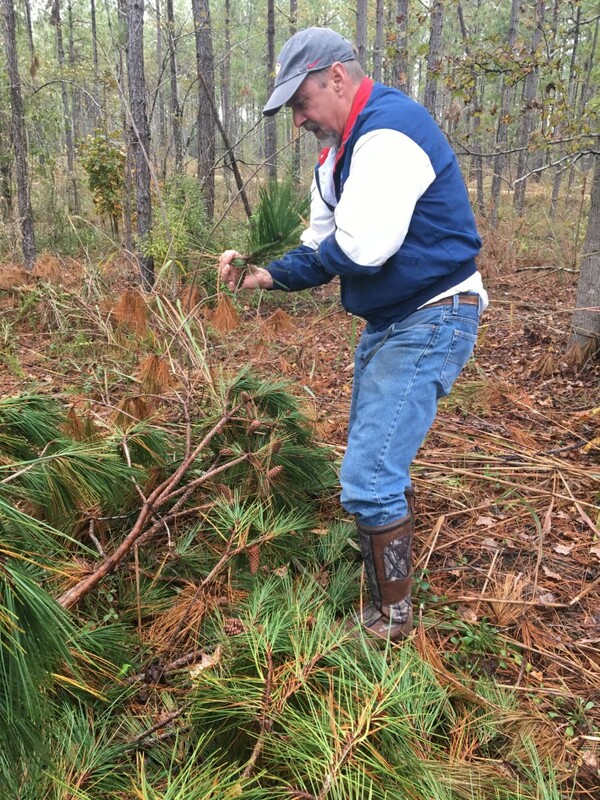 Dr. Dickens marks a tree in a stand of loblolly thinned 3 years ago. Trees marked with a white and red flag are termed 30 degrees. Thomas County Agent Sydni Barwick stopped through on her way to Athens and helped us mark 161 trees. She and Dr. Dickens arrange the color code for tree angles. 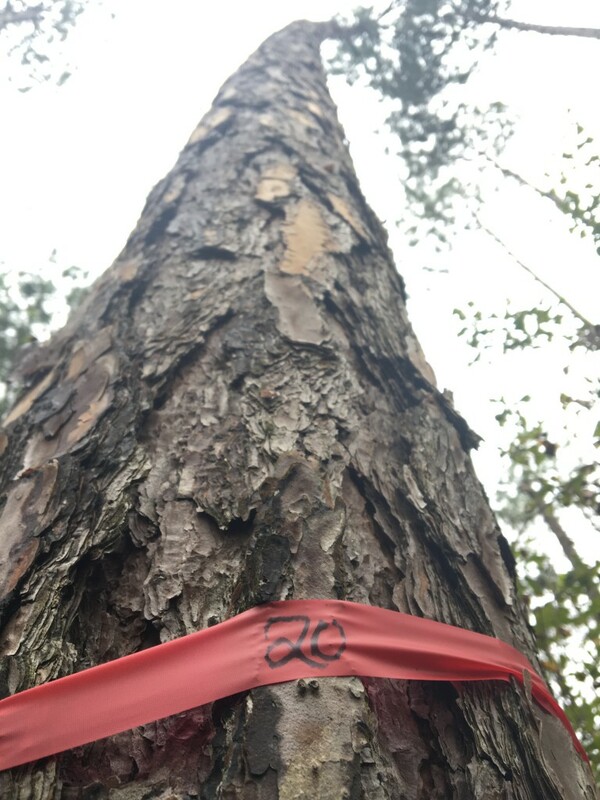 A slash pine in the 55 – 65 foot class I marked as a 20 degree lean. As a taller tree, it may not come out of this small angle lean. It depends on the lean and the height. Posted in Forestry. Bookmark the permalink.